Joe has developed some workouts and stretching/mobility work for everyone to do for the next month or so until we start practice again. This will be a great base to start the spring with and will help work out some of the muscle problems, pain, and such that have developed over the fall. He will also be posting some related videos on youtube which I will link as soon as they are up. Everyone go renew your USAU membership, or sign up for our new guys/girls. You will need to be a member for several of the spring tournaments. Get it now while they are doing a discount. We have gotten approval to go to the tournament in Raleigh, NC on November 22-23, 2014. More details on fields, hotel, departure time, etc. will be forthcoming. Please let your parents know and make sure you can go, and ask off work if that is an issue. If you can't go we need to know ASAP so that we make sure we have enough players for 2 teams. Everyone be at Nike Park by 7:30 on Saturday to help set up and warm up. Everyone needs to be paying fall dues! Girls/JV/Parents need to come volunteer this weekend. Captains need to get a list of numbers together so new players can order jerseys. Varsity/JV should be split if there are numbers. Remind everyone to pay dues. Remind everyone to get off work for Carrollton Clash and Tuneup. Parent Meeting Recap, from the 9-29-14 parent meeting. Dues can be reduced by $10 by a parent or the player volunteering at our upcoming tournaments. You can volunteer at either one. We always need a few extra folks first thing in the morning to help setup, at the end to pack up, and on Saturday afternoon at Tidewater Tuneup when we serve dinner. You can see all the tournament dates on the Calendar page. We have discs for sale for $10. Jerseys information will be coming shortly. Game Times: 8:30am, 10am, 11:30am, the 4th game will depend on performance it will be at either 1pm or 3pm. Carpool: We will meet at Woodside at 7am and get on the road no later than 7:15am, be on time or we will leave without you. The list for varsity as of now will be as follows. Players can be moved up or down for tournaments or the whole year at the discretion of the coaches. Anyone not listed will make up the JV team. We will be split from this point forward based on the varsity list posted. Remind all varsity about the 1 day tournament this Sunday. Joe will lead a conditioning based indoor practice, once he's done play some hotbox like we did indoors last season. Let everyone know Varsity has a 1 day tournament on Sunday Sept. 28th at William and Mary get off work if needed. Anyone not on varsity last year will be told if they are going Monday after the camp. Our year has come to a close and as usual we will do a banquet to wrap up. This years banquet will be a fun little indoor ultimate tournament at Woodside, followed by food and drinks. We will have the banquet on Sunday June 1, 2014. Everyone needs to get there at 11:30am to warm up a bit we will start playing at 12:00pm, we will play a few games and then eat and wrap things up probably about 6-6:30pm. The team will be providing pizza and drinks, we would like everyone else to bring sides, deserts, etc. Let Coach Chappell or Richard know if you plan on attending. We will be leaving from Southerns as quickly as possible after school. The coaches will be getting the transportation and getting back to the school as quickly as possible. Everyone be ready to leave, pack lightly as usual we don't have a ton of extra space on these long trips. You need to turn in your permission form by Thurday along with your $35 players fee to Chappell. Reminders: Everyone going to Southerns needs to be paying for Southerns ASAP. Anyone still owing Spring dues or Jerseys also needs to pay. VA States is this Saturday and Sunday at Dorey Park in Richmond. The address for Dorey Park is 2999 Darbytown Road, Henrico, VA 23231. Vans will be at the school at 6am, We need to leave by 6:15am. Everyone be on time and ready to go if you are riding in the vans. Anyone riding with a parent or another player, you can meet at the school and we will have a big Woodside convoy, or you can go straight to the fields, you will need to be there NO LATER THAN 7:30 am. Sunday will be based on Saturdays results. Tidewater Summer League signups have started, this is a great chance for everyone to play in the summer. All our newer players on the JV and Girls teams this is a great chance to stay sharp and get better during the summer and come into the fall ready to step up. We will be going to Shore Tour on April 12th. It is a 1 day tournament, we will be bringing Varsity and JV as a single team, and a Girls team. TIME CHANGE! We will be leaving from Woodside at 5:00am in order to get to the fields with time to warm up and to account for stops along the way. We need to be rolling at 5:00 so be there on time and ready to go. Return time will be roughly 8:30pm. If you haven't already turned in your permission slip bring it with you that morning. If you haven't already turned in your medical authorization form bring it with you that morning. You can find it HERE. If your parents are planning on going please let your respective coach know, if they have space and are willing to take other players please let us know that as well. The address for the fields at Queen Anne County High School is 125 Ruthsburg Road, Centreville, MD 21617. Below is a list of the money we believe is owed to the team for Spring Dues, and Jerseys, if you disagree please come talk to Coach Chappell or Coach Richard. Otherwise please get your money in. Spring Dues are due by April 18 those not paid will not play at States, Jerseys need to be paid you must have matching uniforms to play at Southerns. Anyone who wasn't on the team in the fall can order jerseys first come first serve from the extras we purchased, cost will be $60, new girls will be given priority so they can match for Southerns. Remind everyone about W&M tournament, Shore Tour, Saturday Practice April 19, paying spring dues, and paying for jerseys. If you are still looking for a hotel the team hotel is listed on the calendar. Varisty needs to be at Nike Park at 7am to help set up, lets get everyone there on time so we can get it knocked out and be ready to warm up on time. Games on Saturday should run until about 5. We will figure out Sunday at the end of the day Saturday as we see where our results place us. You will need to be there the same time though. Any girls or jv wanting to come volunteer or support the varsity are welcome. All new players this spring can earn $15 off jerseys by coming out and volunteering for a few hours either day. The rate is $89/night for 2 doubles, complimentary breakfast is included. We are planning on driving to the tournament on Saturday morning and only staying 1 night (Saturday). This hotel is only a few blocks from Washington and Lee HS where one of the teams will be playing, we just don't know which team yet. Endzone Practice - 10 reps for each team running Red and 10 reps playing D, start on both sides and middle, right on the line and out to about 7-10 yards, work on clean cuts and clearing, maintaining possession with handlers as needed. The girls team will be headed to Morrisville, NC to play this weekend. Games start at 9am, Woodside has a first round bye and will be starting at 11am. Girls need to meet at Woodside at 5:45am to load up and head out. The fields are located at 228 Aviation Parkway, Morrisville, NC 27560. The girls and their chaperones will be staying at the house of a family of one of the NC players, I won't put their info on the blog but email woodsidehs.ultimate@gmail.com if you would like that information about where your daughter will be. In addition the girls will get the chance to watch a showcase game from some Nationals caliber women and enjoy dinner at East Chapel Hill High School after play. ECHHS is at 500 weaver Dairy Rd, Chapel Hill, NC 27514. The team is having a sleepover at Coach Haley's house on Friday, this is not organized by Woodside, but we hope the ladies have fun and get some sleep so they are ready to dominate this weekend! The guys will be playing at home this weekend in Woodside Invite - Developmental. We need all the guys to be at the fields by 7:45am to help setup and then get in a good warmup for games. The schedule for the weekend is linked on the Woodside Invite page. 1. Schedule - You can get a good idea of our spring schedule on the Calendar page. We list the tournaments, where they are, which teams are going and other pertinent information as we have it. 2. USA Ultimate Membership - All players need to be up to date USA Ultimate members, this allows them to play in all the sanctioned tournaments including YULA, States, and Southerns. They can get or renew their membership on the USAU Membership page. The cost is $30, this is separate from their spring dues. 3. Spring Dues - Spring dues will be $35 for Varsity and Girls, $25 for JV, as mentioned above this does not cover their USAU Membership, this also does not cover the player fee for Southerns. The dues cover only a minimal amount of our expenses most of our season is funded by our tournaments so please volunteer and help at the tournaments. Spring dues are also lower than previously in order to try and ensure we recoup the fall dues still owed. 4. HS Southerns - Southerns is a Regional Championship tournament that we attended in 2013 and were awarded a spot in 2012 but were unable to attend. We will again be putting in a bid and hopefully awarded spots for both our varsity and girls teams. All attending players must be up to date USA Ultimate members, must have matching uniforms, and there is a separate player fee (previously $30/player) which will be required to be paid by the players. We will announce the fee as soon as we know, and assuming we are awarded bids. 5. Woodside Invite Volunteering - As mentioned our tournaments provide a significant portion of our funding for the year, therefore it is vital that they run well. We need parents and players from the team not playing to come help with setup, concessions, cleanup, etc. 6. Jersey Discount - We have a jersey discount offer for new players. We made this same offer in the fall to all players, so we want to give the new folks the same opportunity. 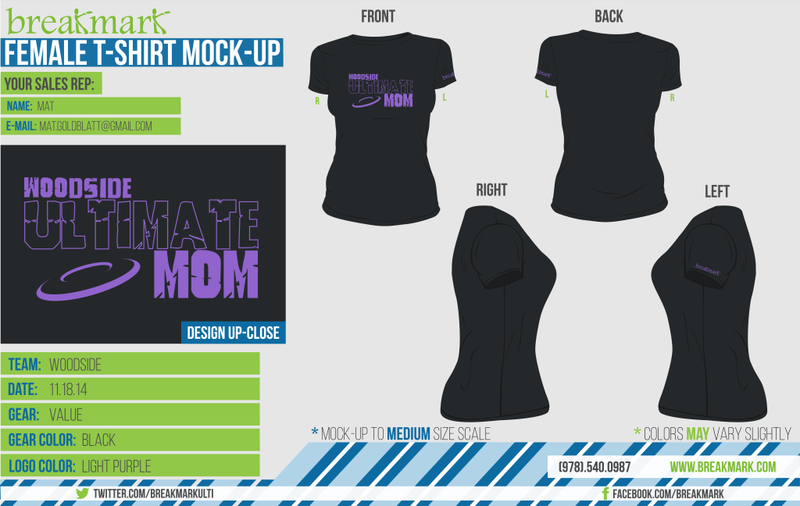 If you or a parent volunteers at one of the Woodside Invite Tournaments you will receive $15 off the cost of jerseys. 7. Jerseys - Since we ordered jerseys in the fall we have a limited number of extra jersey sets, all extras will be sold on a first come basis. Once all jerseys are sold we will have to reorder for those folks remaining. A reorder of a small quantity will be expensive so get an extra now or you will get stuck with a higher price. You can see what you owe for jerseys HERE. 8. Fall Dues - Some folks still haven't paid fall dues. We have a complete list HERE. All current players need to be getting their USAU up to date or signing up for the first time. Varisty and Girls need it by Feb. 26, JV by March 18. 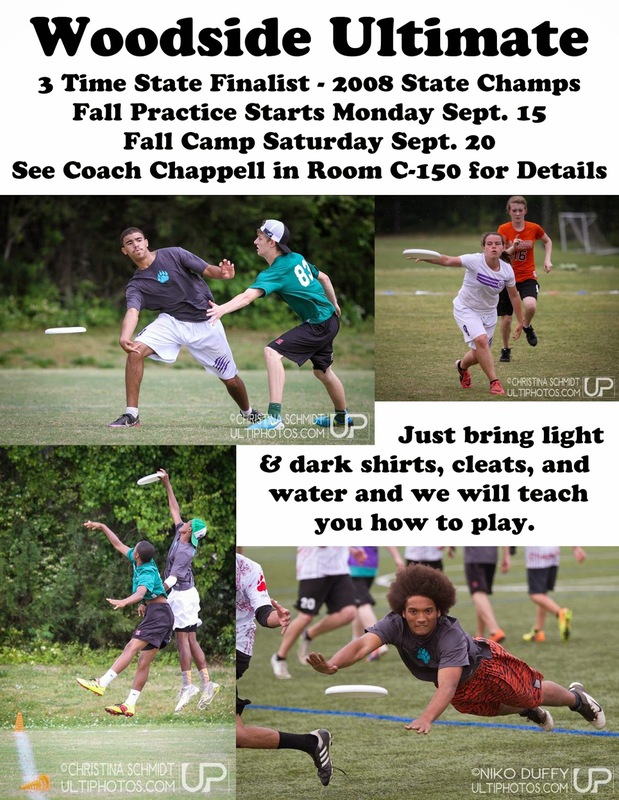 Give your USAU number to Coach Richard once you sign up. You can signup or renew HERE. We will have our spring parents meeting on Monday February 24, 2014 at 6pm in Coach Chappell's room, C-150. We will be discussing the spring tournament schedule, dues, USAU membership, jerseys, states and southerns, and volunteering for spring tournaments. Everyone tell your parents and get them to the meeting! Also please keep bringing in the fall dues you still owe and the jersey money, you will not get your jerseys until you have paid. Woodside Folks need to be at the fields no later than 8:30 to do some setup and to warm up. Games start at 10am we will go until about 4:30, if you are getting picked up have your ride there early so you can leave as soon as we say, Coach Richard and Chappell shouldn't have to wait on you. We will be playing at Nike Park in Carrollton, VA where Tidewater Tuneup is held. 13036 Nike Park Rd. will get you there on the gps. We are playing the first 5 rounds, the remaining games are not being played. Everyone gets 4 games. Bring your dark and light jerseys, water, cleats, appropriate weather gear, etc.